SAMPAR had recently been made available in the Malaysia market, they are from Paris. Pioneer of urban skin care, SAMPAR has an ambition: to awaken the sleeping beauty in everywoman, uncovering and revealing her natural allure. SAMPAR product lines are formulated with Urban Advance concept. Our skin is an intelligent organ, capable of adapting to its environment. However, age and repeated external aggressions weaken its ability to rebound. The skin becomes sensitive, dull, marked and unbalanced. SAMPAR mission is to reset the skin’s intelligent response system and to support its natural healing actions. With products enriched in the brand’s exclusive complex, Urban Advance, its innovative formulas act at the heart of cells to “wake-up” and reactivate the skin’s vital functions. As a result, the skin recovers a state of equilibrium, which in turn allows care efficacy to be optimized and leads SAMPAR active ingredients to higher levels of performance. Three weeks ago I received some sample items from SAMPAR Malaysia to try them out and a full size Quenching mist. I’ve decided to complied all the items in one blog review as I think it’s more relevant to some of you if you wish to compare the skin care range. Velvet Cleansing Milk, Skin Quenching Mist and Ultra Hydrating Fluid. I’ve previously reviewed on Skin Quenching Mist here. It’s basically a face mist. The very first step in cleansing. Milky in texture, it removes traces of pollution and make-up. It is suitable for sensitive skin. Apply before cleansing on morning and evening over eyes and neck then rinse off with warm water. Tip: It doesn’t removes heavy make up, only light make up that is non-waterproof. Your recommended to use other eye make-up remover. A moisturizer that quenches thirsty skin, strengthening restructuring mechanisms and protecting it all day long. Apply evenly on face after cleansing and toning. I call this magic to instant glamours skin! Glamour Shot is the 1st transparent foundation to be applied over your daily moisturizer. Instant results, wrinkles are visibly corrected. Unwanted shine, fines lines, pores, redness and blemishes fade away in just seconds. The skin texture is smoothed, and the complexion is matte. Contains HQA microlens, new generation soft focus, reduces the appearance of pores, smoothes and mattifies the skin. Oat extract provides an optimal and immediate lifting effect. Encapsulated hyaluronic acid improves skin density and fills in wrinkles for a long-term effect. After moisturizing, apply a small amount and circulate it over your face. Tip: After applying Glamour Shot, you are not required to apply any press powder or foundation on your face, as your face will be as smooth as Barbie’s skin, however if you wish to apply, just use a small amount of foundation and gently tapping onto your skin, if you use your fingers to blend the foundation/BB Cream, you’ll notice small amounts of flakes & uneven texture as you’ve applied Glamour Shot and foundation, this two layers don’t blend well. Best just stay away from the foundation/BB Creams. If your worried there’s no SPF protection, then I recommend you use Glamour Shot only on special occasions where you wish to be photographed with perfect skin. Texture of Glamour Shot and Splendid Eyes Elation on my hands. It works all night long to revive the eye area. This renewing treatment fades wrinkles, polishes and revamps facial features while eliminating dark circles and puffiness. Clear Solution Mask soaks up impurities and clarifies the skin without drying it out. An exquisite blend of kaolin, geranium and sweet almond oil, this purifying mask tightens pores and it is especially suited for oily and combination skins. 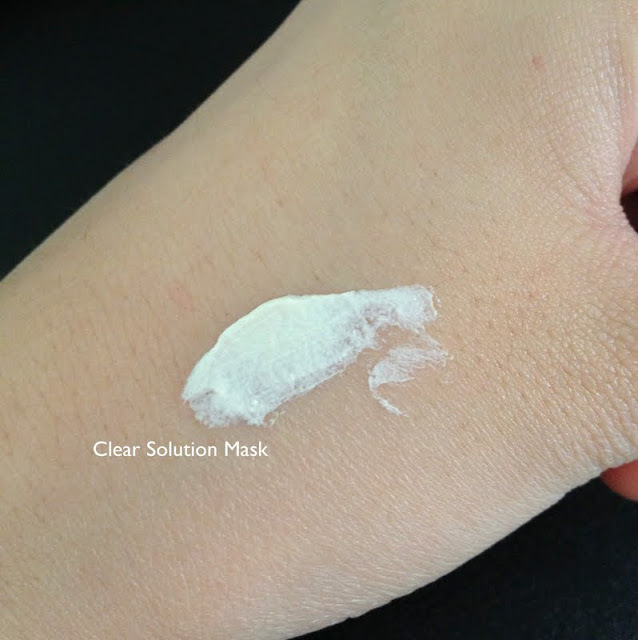 Apply a thin layer of Clear Solution Mask on cleansed skin, avoiding eye area. Leave for 10 minutes. Rinse with warm water. Another tip, this mask may also be used to treat imperfections. You can apply it only onto blemished spots and leave on all night long. However I’ve yet to try this, as I feel as a mask it should not leave on skin for a long period of time. It’s up to your experimentation. In 1 minute, this multi-action glamour revealer erases dark circles, brightens the dark areas around the eyes and blurs under-eye wrinkles and fine lines. With hyaluronic acid it offers a long-term and lasting anti-wrinkles action. I find that the scent of the product are relatively pleasant although some may be able to detect strong scent of alcohol on some items, to me the scent is okay. Items that are suitable for sensitive skin are only the Velvet Cleansing Milk and Quenching Mist however most of their product are not. Their product contains contains alcohol, if your skin is extra sensitive I won’t recommend using. I’m not able to detect which product my skin reacted to it (probably it’s Glamour shot or the moisturizer) as I’v stopped using due to some pimples appearing on my cheeks. Currently, my skin condition is back to normal, I’m not having PMS so I presume my skin is slightly sensitive towards it usually my pimples only pops out during PMS on t-zone area. Never happened on cheeks before, I’ve used a numbered of products available on the market and mixed products sometimes, knowing my skin condition. My favourite picks would be Glamour Shot and Glamour Shot Eyes, it’s like casting a magic spell on your skin. The Quenching mist is very handy and useful for a quick fix of hydration. All SAMPAR product line consists of Urban Advance Complex, a powerful alliance of 3 active ingredients (shea butter serum, mint endorphin and probiotic sugar). Acts as an anti-oxidant shield, neutralizing any cutaneous imbalances linked to pollution, strengthens the skin’s natural defenses and shocks the skin back to life on a cellular level. For ingredients list of individual items it is available at the links below. You can get SAMPAR @ Parkson in Sunway Pyramid or through sampar.my website. Stay updated with Sampar Malaysia on Facebook for updates and info. PS: SAMPAR products are available in WonderBox beauty subscription in Malaysia. How did u received the free sample? I would like to try some too because one of my friend tried it and she has sensitive skin and it works for her. I see her changes too but I’m not too sure if it will suit me.